In November 1917 the British government made a pledge with the Jewish people through the Balfour Declaration to help establish a Jewish National Home in the territory known as Palestine. During the 200 years leading up to the Balfour Declaration there was a broad vision in the Church in Great Britain for the restoration of the Jewish people to their ancient homeland. This vision, supported by the great revivalists such as George Whitefield and the Wesley brothers, was based on the Covenants of Promise as well as other prophetic Scriptures found in the Bible, and many Christians were inspired to pray into it. The Balfour Declaration was the fruit of this vision. At that time, Great Britain was the nearest example of a truly Christian nation that has existed since the time of Christ two thousand years ago, and her empire – the largest ever in human history – stretched across one third of the world’s land mass. It was said that the sun never set on the British Empire. Sadly, because of political expedience in appeasing a militant Arab nationalist movement, duplicity in her dealings with both Arabs and Jews, and even treachery towards the Jewish people, Britain became instead the major obstacle in the fulfilment of the purposes of God. In addition to causing the wholesale misery of many thousands of Jewish people who were turned away from the shores of Palestine in the 1930s and 40s, the British reneging of the Balfour Declaration was also responsible for the deaths of an untold number of Jews who could have escaped Hitler’s Final Solution, had they been able to find refuge in their ancient homeland. Even after the War was over Britain continued to turn away traumatised survivors of the Holocaust from the shores of the Land of their forefathers. Today, very few British people – Christians included – know anything about this dark chapter in our history. Is it mere co-incidence that since the end of the Mandate in Palestine in 1948 that the sun finally set on the Great British Empire and her status as the world’s superpower disappeared? 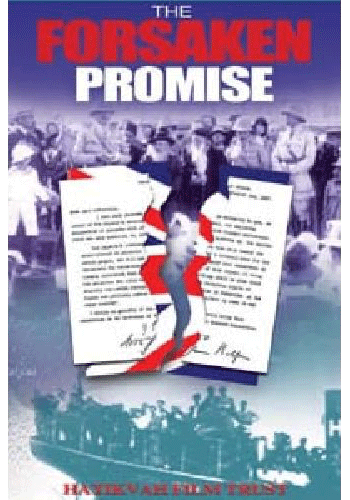 The Forsaken Promise, a 3-part documentary series, highlights a number of tragic events that took place during the Mandate period, mainly through the testimonies of those who were either victims of those events, participants in them, or eye-witnesses to them, including the Late Derek Prince. Its purpose is to stir up repentance in Britain for the nation’s reneging of the Balfour Declaration – the forsaken promise – and obstructing the purposes of God in the restoration of Israel. There are many church leaders in Britain who are crying out for the restoration of God’s favour and blessing upon this country, and there are some who believe that the Lord has not forgotten our spiritual heritage as a Christian nation. Because the Church’s calling is to be the ‘prophetic voice’ in the nation, this documentary’s prime target audience is the Church.